Alumina Ceramic Labware is a high-grade ceramic material that is ideal for laboratory applications. It is well balanced and physically stable. In addition, this fine ceramic offers exceptional chemical and corrosion resistance, high hardness, strength, and durability, superb wear resistance and high resistance to alkalies and other fluxes. 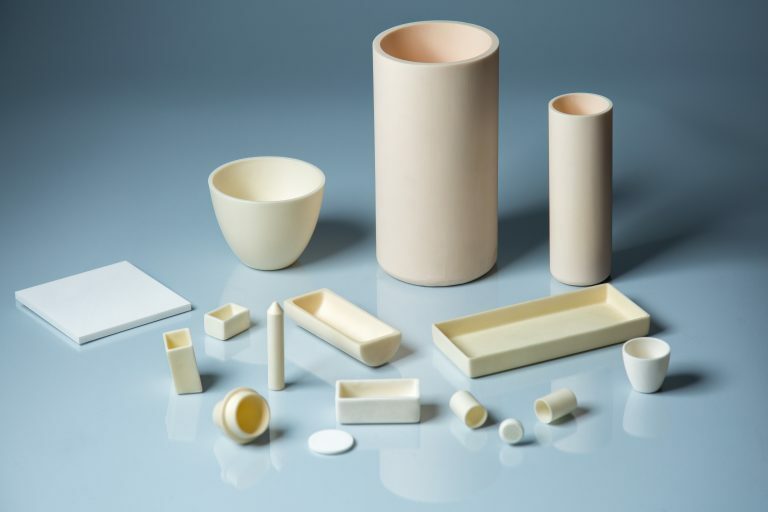 Some of the most common industrial ceramics applications for which we manufacture alumina ceramic labware include: high-temperature working conditions, conditions that demand contamination-free results, laboratory furnace use and laboratory vacuum use. LSP Industrial Ceramics, Inc. offers a wide range of Alumina Ceramic Labware. Our Alumina Ceramic Labware products are available in a variety of sizes, configurations and materials to meet your unique requirements along with custom manufacturing capabilities. *Lids are available for all industrial ceramic products upon request. We work with only the highest grade alumina materials. Our alumina ceramics labware products can be made from 99% pure alumina, 99.5% pure alumina and 99.7% pure alumina. These varieties are quite similar to one another, and share many features, including general compactness levels, water absorption rates, general gas permeability and hardnesses. When you look closer, though, each type of alumina offers something different. Each, for example, has a different maximum working temperature and long term working temperature. The main characteristics of 99% alumina are: hardness and chemical stability. Meanwhile, 99.5% alumina is best known for its high chemical resistance. Finally, ceramic material with an alumina of 99.7% alumina or more is distinguished by its good plasma resistance, high purity and wear resistance. When you discuss your application with us, we will help you determine which alumina right for you. Our inventory of unfired material allows us a great amount of creative and technical flexibility. With it, we can create custom parts with properties that match your application perfectly, no matter how large or how small. Our standard alumina ceramic labware products include: alumina cylinder crucibles, canfield crucible sets, alumina combustion boats, alumina rectangular trays, alumina round trays, ceramic alumina plates, alumina flat bottom crucible conicale, alumina high form crucibles, alumina square crucibles and alumina round disc. Our other alumina products include items such as: alumina tubes, alumina washers, alumina solid rods and more. If you do not see what you’re looking for on this list or on the pages linked below, we still want to hear from you, so send us a request for information. We take custom requests! This is an exciting time for advanced ceramics. The industry is growing exponentially and we’ve only scratched the surface of what is possible with them. Here at LSP Industrial Ceramics, we’re equipped state-of-art machinery. In the hands of our forward-thinking staff, this machinery helps us explore where advanced ceramics can take your application. When you approach us with your custom ceramic machining requests, our experienced team will work with you closely to develop the right material and design solutions. When we’ve reached the right solution together, our team will manufacture your products using said in-house state-of-the-art manufacturing machinery. If you’re ready for us to assist you with developing, manufacturing, and applying advanced technical ceramic materials, contact us today. We look forward to working with you! LSP Industrial Ceramics, Inc. is a technical and industrial ceramic products manufacturing and distributing company, based out of Myrtle Beach, South Carolina. For over 30 years, we’ve been providing customers with a wide range of ceramic solutions, including but not limited to: ceramic bushings, ceramic washers, ceramic eyelets and ceramic electrical insulators. In addition to alumina ceramics, we work with steatite ceramics, zirconia ceramics, boron nitride and silicon nitride. We specialize in technical and industrial ceramic products for high-stakes industries like: medical and lab, chemical research and development, defense technologies, electronics, equipment and machine construction and automotive manufacturing.